Gold was slightly higher overnight, trading in a narrow range of $1318.40 - $1322.45. It ticked up to its high early during Asian hours, boosted by a pullback in the US dollar (92.58 – 92.36). Unrest in the Middle East over the opening of a new US embassy in Jerusalem was supportive of the yellow metal, as was some slightly dovish commentary from the usually ultra-hawkish Loretta Mester of the Fed ("We want to give inflation time to move back to goal ... this argues against a steep path,"). However, gold drifted back to its low later during European time, hurt by rising global bond yields (German Bund from 0.551% to 0.609%, UK Gilts from 1.448% - 1.490%, US 10-year from 2.959% - 2.988%), and mostly firmer global equities. The NIKKEI gained 0.5%, the SCI rose 0.4%, Eurozone shares declined from 0.2% - 0.4%, while S&P futures were +0.2%. A perceived thawing in US-China trade (Trump pledged Sunday to help Chinese frim ZTE to “get back into business” after a US ban had hamstrung the company) helped boost stocks, as did firmer oil (WTI from $70.50 - $70.80). After the NY open, gold ticked down to $1318.15, but support in front of yesterday’s $1318 low and former quadruple top resistance held. By mid-morning, the DX slipped further (92.26), weakened by strength in the euro from some hawkish commentary from the ECB’s Villeroy, Lautenschlaeger, and Praet (recent easing of price growth was likely temporary, signaling the ECB was still on course to withdraw its monetary stimulus). Gold traded up to $1321.20 in response, and was also aided by reports of increased violence in Gaza over the new US embassy (dozens of Palestinians killed, over 2k wounded), and some dovish comments by the Fed’s Bullard (with a risk of a curve inversion, no need for Fed to quicken its pace of increases in short-term rates). Later in the morning, US stocks climbed higher (S&P +15 to 2742), with tech, energy, and health care leading gainers. The 10-year yield ticked up to 2.997%, and the dollar bounced to 92.45. 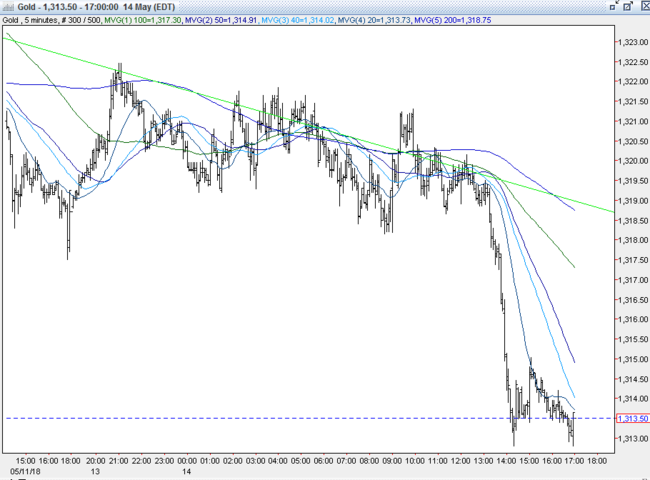 Gold retreated, but support in front of the prior low limited the dip to $1318.50. Into the afternoon, though US stocks retreated back to unchanged and the US 10-year yield dipped to 2.986% - the dollar rebounded. Weakness in the euro (support at $1.195 failed, hits $1.1935) drove the DX through its overnight high to reach 92.63. Gold’s support at $1318-19 finally broke, and the metal tumbled through some sell stops to reach $1312.80. It was $1314 bid at 4PM with a loss of $5. Open interest was off 4.1k contracts, showing a net of long liquidation from Friday’s decline. Volume ballooned with 502k contracts trading. The CFTC’s Commitment of Traders Report as of 5/8 showed the large funds cutting 11k longs and trimming 11.7k shorts to slightly increase net long position to 107k contracts. This remains the lowest Net Fund Long Position since 12/12/17, and is of course not very bullish for sentiment. However, this positioning is relatively and historically small, and shows gross shorts remaining elevated. Also, the heavier short covering seen during gold’s bounce from $1302 on 5/1 to $1319 on 5/7 is a step in the bullish direction. Combined, it leaves the gold market set up well to move higher - provided there is a spark - as there is plenty of room from sidelined longs to enter, and excess shorts can fuel a rally if / when they are forced to cover. 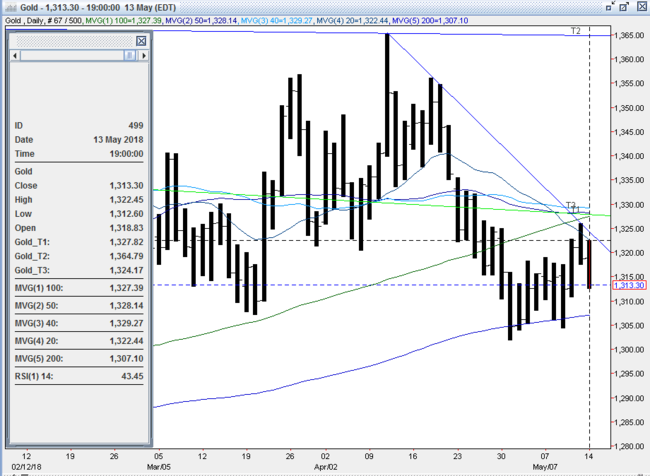 Bulls were disappointed that gold couldn’t hold support at $1318-19 today, given the pullback in the DX. However, they’re encouraged that the COT Report showed some large funds bailing on their bearish view (improving market sentiment), but that the market is still set up quite well to move higher. They maintain the dollar’s direction is still lower, and will fuel future advances. Bulls are targeting a breach of the confluence of resistance at $1322-28 ($1322-23 – 5/10 and 5/14 highs, $1323 – 20-day moving average, $1324 – down trendline from 4/11 $1365 top, $1325-27 – quadruple top, 4/26, 4/27, 4/30, and 5/11 highs, $1325 – options, $1327 – 100-day moving average, $1328 – 50 day moving average) to trigger some additional short covering and bring into play next resistance at $1332-33 (double top - 4/24 and 4/25 highs). Bears are still comfortable selling into strength and were pleased with gold’s dip under the old resistance level at $1318-19. They still maintain that a long-term bottom at 88.25 from 2/16 in the DX is in place, and expect renewed strength in the greenback to fuel a further decline in the yellow metal. Bears are still looking for a failure of support at $1304-07 (200-day moving average, triple bottom) to set off liquidating stops that they expect will breach the triple bottom at $1302-03 and then $1300-01 (50% retracement of up move from 12/12/17 $1236 low to 1/25/18 $1366 high, psych level, options) to bring the low $1290’s and high $1280’s into play. All markets will continue to focus on the volatility in the equity and bond markets, geopolitical events, developments with the Trump Administration, corporate earnings, oil prices, and will turn to reports tomorrow on Chinese Retail Sales and Industrial Production, Eurozone GDP Industrial Production, and ZEW Survey, UK Employment Change, US Empire State Manufacturing, Retail Sales, Business Inventories, NAHB Housing Market Index, and comments from the Fed’s Kaplna, Williams, Clarida and Bowman for near-term guidance.